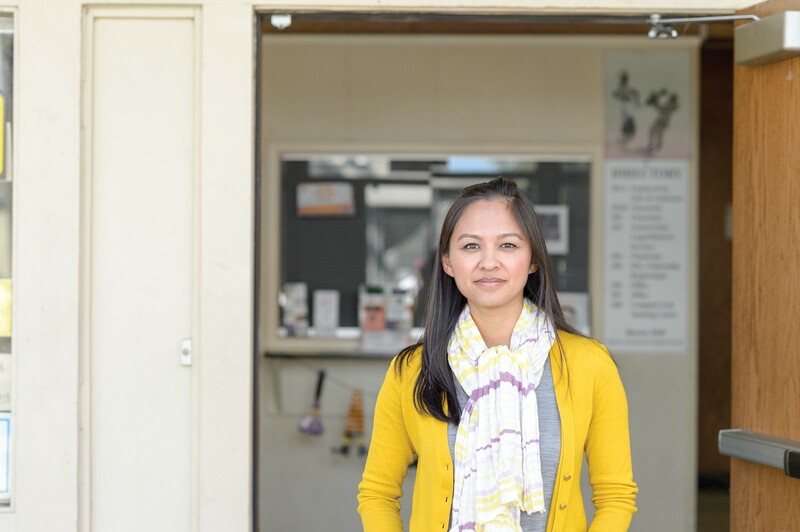 Thao Dang Weldy is worried about the ballpark’s impact on small businesses. In the middle of Eastlake’s Clinton Park, surrounded by pho restaurants and boba shops, sits the Vietnamese American Community Center of the East Bay. It’s a place where Vietnamese immigrants and refugees frequent for support — and it’s just a few blocks from where the Oakland A’s want to build a 35,000-seat ballpark. Program manager Thao Dang Weldy is worried about how the stadium might impact the neighborhood’s small business owners. In the short term, construction may block access to storefronts and parking. In the long term, rents could rise, leading to widespread displacement. People of color and immigrants dominate the Eastlake neighborhood. The 94606 zip code, which includes Eastlake, is 42 percent Asian, according to 2010 census data. Among the Asian population, 58 percent is Chinese and 20 percent is Vietnamese. Many of the businesses in Eastlake specifically cater to these communities. There are small markets, florists, a dentist, a seamstress, and an immigration law office, for example, with many employees who don’t speak English. If development rolls in and property prices skyrocket, there’s a fear that these small businesses could lose their clientele and be forced to leave as well. The Express visited or called 20 Southeast Asian-owned businesses in the greater Eastlake area. Many business owners hadn’t heard about the ballpark. Others declined to speak, stating they had no opinion. Some of those who did, however, expressed hope. Puan Tran, an owner of Mien Tay Restaurant, is optimistic about the stadium plan. 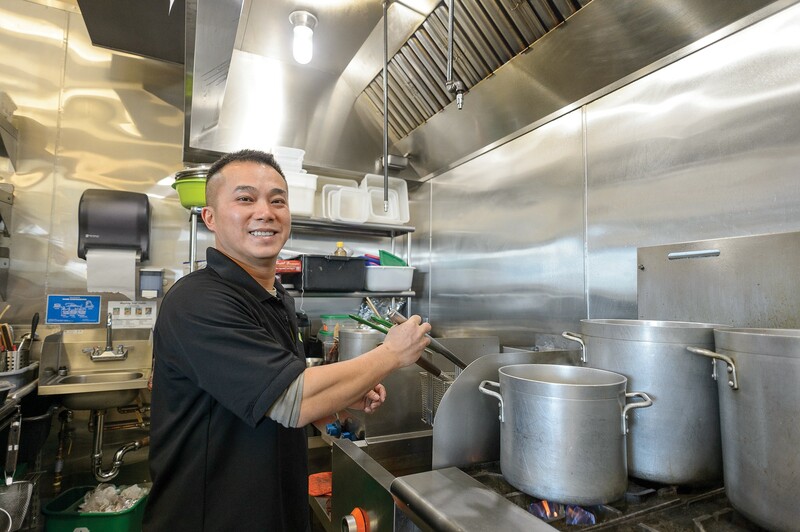 He’s not too worried about Mien Tay’s rent rising — that’s just an inherent risk in operating a business in Oakland, he said. Over in Chinatown, the main concerns among business owners are displacement and increased traffic. Andy Chan’s Bay City Auto has sat on the corner of Oak and 6th streets since 1999. His rent has steadily increased over the years, but he’s worried the A’s stadium would raise it considerably higher and faster. To start over at a new location would be prohibitively expensive, he said. The traffic is also a major concern for Alicia Wong, owner of the Fortune Cookie Factory, which has been run by the same family in Chinatown for more than 50 years. The factory crafts cookies for special events, and deliveries comprise 60 percent of its business. “Traffic equals less stops, less product, less profit,” Wong said. Wong also doubts the stadium will bring in more business to Chinatown’s existing mom-and-pops because they cater to different populations, and she worries the increased crowds would actively discourage Chinatown locals from patronizing their usual businesses on game days. The Oakland chambers of commerce and other business leaders have come out in support of the A’s stadium, including the unofficial mayor of Chinatown, Carl Chan, with eyes set on increased foot traffic and job creation. Wong isn’t so sure this applies to many of the current businesses in Chinatown. According to Jennifer Tran (no relation to Puan Tran), a board member with Oakland’s Vietnamese Chamber of Commerce, the chambers are supportive of the A’s under the assumption that a series of criteria will be met. The chambers are still crafting a joint statement on these criteria, but Jennifer Tran expects it to include transparency, “genuine community engagement,” a racial and economic impact assessment, and promises for affordable housing and business improvement districts. She emphasized that this is not all on the A’s, though. But Dang Weldy and other community members said they’re not sure the city always has the Asian-Pacific Islander (API) community’s best interests in mind. “Traditionally, Asians — folks from the Chinatown and Eastlake neighborhoods — are at a disadvantage because there are not as many politicians that are speaking out for our concerns,” she said. If the A’s do wind up moving to the Laney College site, Dang Weldy said she hopes Eastlake won’t lose its distinctive Southeast Asian culture. “We need to make sure there is some kind of funding in place for cultural maintenance of the area ... so that it does feel like a community and not just a corporate village environment, which is what I’m afraid it’s gonna turn into,” she said. Similarly, business owners in Chinatown already see more non-Chinese businesses opening in the area every year. If the A’s move in? “I don’t know if Chinatown will still exist,” Andy Chan said. In her view, the best-case scenario is that the A’s, the city, community organizations, and business owners all band together. The worst-case scenario is that folks stay divided on the issue while the A’s agree to the chambers’ demands but don’t wind up following through on them. “When I take off the chamber hat, I am concerned that if this decision passes it might be business as usual, because historically, these big moves have irreversible consequences for communities of color,” she said. Environmentalists say the stadium could cause a die-off of birds and force them to leave the area completely.